“We see that sign every day, but how often do we think about what it means?” said Jean Ambrose, a Wood County resident. 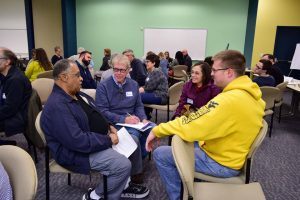 Nearly 60 Mid-Ohio Valley (MOV) community members—including seven of nine Parkersburg City Council members—came out on a Monday night to deliberate what it means to be an inclusive, welcoming community. 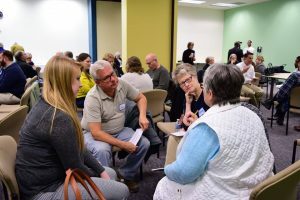 What’s Next, Wood County?, the group who convened the meeting, has been encouraging Mid-Ohio Valley residents to engage in public dialogue about the economic wellbeing and future of their area since 2014. Their goal is to help the MOV become a more prosperous, thriving community—an idea that members have decided also means being diverse and inclusive. They want to live up to their sign. 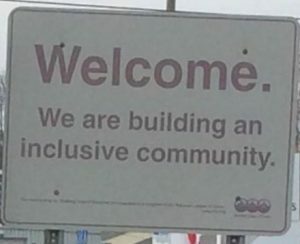 1) From your perspective, what is an inclusive community? 2) How are we building an inclusive community in the Mid-Ohio Valley? 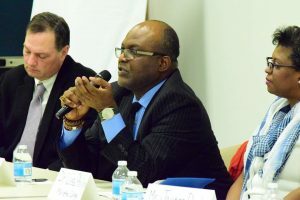 A panel of community stakeholders spoke first—some of them were traditional leaders in economic development; city council members, the Chief of Police, and the county commission. But, others were voices that aren’t heard as often. Faculty of color from the local universities, a spokesperson from the WV Center for Peace and Conflict, and a transgender woman from the community spoke to what being included means to them. Residents confronted some sensitive subjects through their honest dialogue with one another. They spoke about what they see that others may not notice. “I can tell you exactly how many confederate flags there are between Marietta and the mall in Vienna,” said one citizen. “I grew up in Baltimore. In my neighborhood, it felt like everyone was black. I didn’t experience […] overt experiences of racism until I moved to Marietta,” said Jayson Douglas, the Coordinator for Diversity and Inclusion at Marietta College. Inclusion and diversity go hand in hand for one city councilman. He shared that before returning to Parkersburg, he lived in various parts of the country during his career. But it wasn’t until he lived in Florida, where he had a broad circle of friends from many different places, that he experienced the vibrancy of a truly diverse and welcoming community. all.” Ogwude, the founder and Executive Director of the West Virginia Center for Peace and Conflict, first came to the MOV from Nigeria as a student in the 1970s. He sees that in the 2000s, the greater Parkersburg area has become more diverse, but not necessarily more inclusive. Ogwude sees inclusivity as the key to working together for greater prosperity. After the panel spoke about their various viewpoints, community members (including the panelists) turned to one another to address what it means to really include everybody, switching off their small groups for each discussion question. First, they reviewed what progress they felt was being made towards building an inclusive community in the MOV. Then, they asked each other what else they could do as individuals—and together—to do it better. Many participants felt that inclusion is personal. They felt they needed to educate peers in their own circles about how to be inclusive. They also saw a need to speak up when they hear or see negative attitudes toward others, but they weren’t really sure how to do that. One Parkersburg City Councilman said, “My best friend is black, and sometimes when we’re together, we’ll hear racial slurs that make me so angry.” His friend downplays the incidents, but the councilman doesn’t want this behavior to go un-addressed. But he also doesn’t know what to do to combat it. Despite experiencing racism, discrimination, and isolation at times, participants in the conversation reaffirmed their desire to be part of the MOV community. “There is the constant pressure to move where there is more access to resources, but I want to stay here,” said the transgender speaker. What’s Next, Wood County? began meeting in 2014, held the bulk of their public conversations in early 2015, and have continued meeting twice a month since. The organization, since last Monday’s meeting, has renamed itself What’s Next, Mid-Ohio Valley? to embrace and include the wider region in its work. They will meet in February to continue their discussion; stay tuned to their Facebook page for details. All pictures from the event were taken by Carrie Adams of Manufactured Dreams. Check out the news coverage this event got on WTAP News here!